Please Note: There will be no yoga class on Easter Sunday, April 21. See you next time! July 22 – 26, for ages 7 – 9. 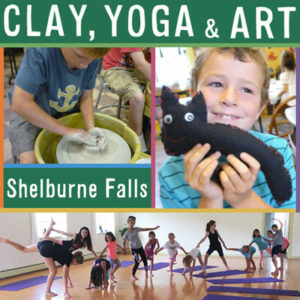 Molly Cantor Pottery, Shelburne Falls Yoga, and The Art Garden collaborate to offer morning clay, midday movement, and mixed media art-making in the afternoons.Children are escorted to each studio.They eat their bag lunches at The Art Garden. Snacks provided.